Cynthia Curtis Pottery invites you to the 12th Student and Studio Potter Holiday Show and Sale November 10-11. 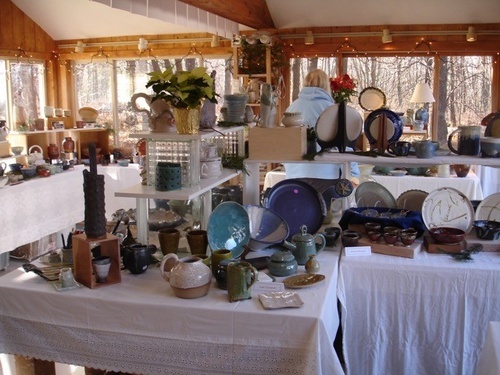 The peaceful pottery nestled in the woods near magnificent quarries and colorful Atlantic coastline is home to Cynthia’s work and has been shared with nearly 1300 students over the past 24 years. 40 of the emerging artists from her studio, as well as their talented, experienced teachers and studio potters, will display hundreds of original ceramics with fresh approaches to functional pottery, at prices you will appreciate! Student and faculty pieces are displayed for the weekend in the beautifully transformed pottery studio while Cynthia's work is on exhibit in her cozy, wood stove- warmed gallery - an inviting place to shop for the holidays and connect with new and familiar friends over a cup of hot cider and delicious homemade cookies. This very well-attended and popular event is the weekend of the November 10-11, Saturday and Sunday, 10 a.m. - 5 p.m. Come meet the artists at the reception Saturday, from 5 p.m. - 7 p.m. Free admission, refreshments and plenty of parking. All are welcome! Profits go to the Cynthia Curtis Pottery Scholarship Fund to help defray the cost of taking a class for those in need. Cynthia’s gallery will also be open throughout the holidays. Private lessons and weekly classes offered year round.